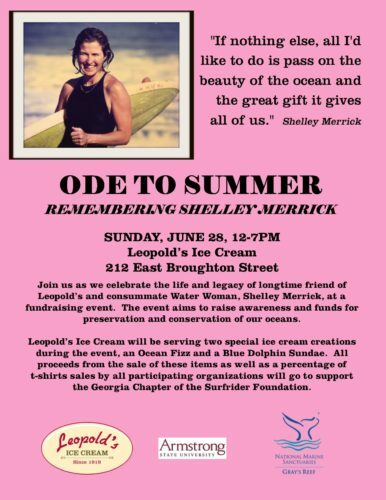 SAVANNAH, GA, June 22, 2015 – Leopold’s Ice Cream, in partnership with Armstrong State University and Gray’s Reef National Marine Sanctuary, will celebrate the life and legacy of longtime friend of Leopold’s and consummate Water Woman, Shelley Merrick, at a fundraising event on Sunday, June 28th from noon until 7pm. The event will take place at Leopold’s Ice Cream at 212 E. Broughton Street and aims to raise awareness and funds for preservation and conservation of our oceans. “Shelley was an extraordinary athlete and a pioneer in the world of women’s competitive surfing. Her respect for the ocean was second only to her love of teaching others about it. It only seemed right to honor her by having fun and raising money for those marine organizations that she supported.” said Mary Leopold on why Leopold’s Ice Cream is hosting the upcoming event. Shelley Merrick was born in Malibu, California, where she found her love of the water, but had lived in Savannah for the past 13 years. She was an accomplished surfer, often called a pioneer and legend in women’s surfing. She took her first ride on a big redwood board when she was only 10 years old and never looked back. Still surfing until her passing in January of 2015, she was a longtime Surfrider Foundation activist and took great pride in teaching kids about the ocean and all that it had to offer. Shelley spent her 13 years in Savannah as the Coordinator of Special Events at Armstrong State University. All partnering organizations will be on-site with information on how you can get involved with education and ocean conservation. Leopold’s Ice Cream will be serving two special ice cream creations during the event, an Ocean Fizz and a Blue Dolphin Sundae. All proceeds from the sale of these items as well as a percentage of t-shirts sales by all participating organizations will go to support the Georgia Chapter of the Surfrider Foundation.